The Class Teacher is Miss Anstey and the Teaching Assistant is Mrs Maw. Our theme for the Springterm is 'Pole to Pole'.We will be learning all about polar explorers including Ernest Shackleton. Today was our parent event and we wanted to share our love of our class book 'Way home for Wolf' that we have been reading over the term. 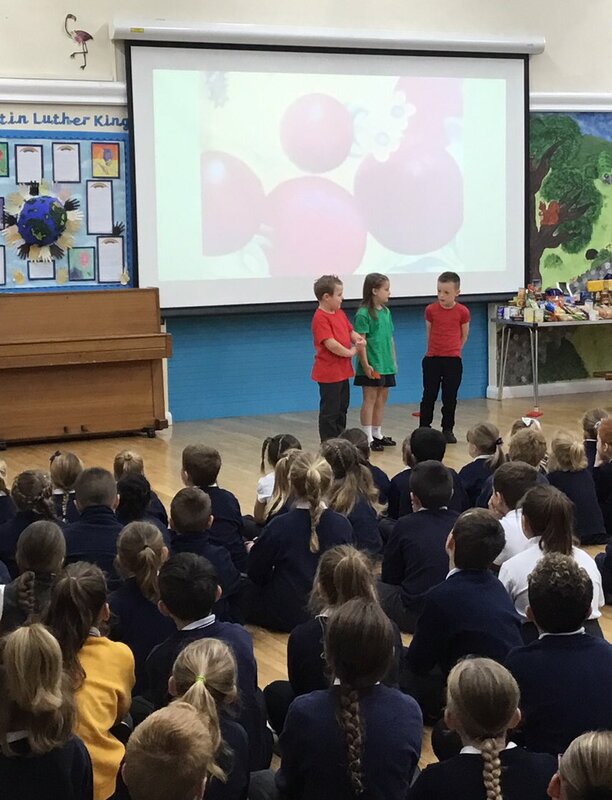 The children beautifully choral read our favourite part so we could introduce the parents to the characters and the plot. 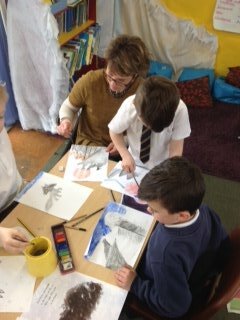 We then sketched the characters and landscapes of our choice using the illustrations and then used water colours to develop the detail. 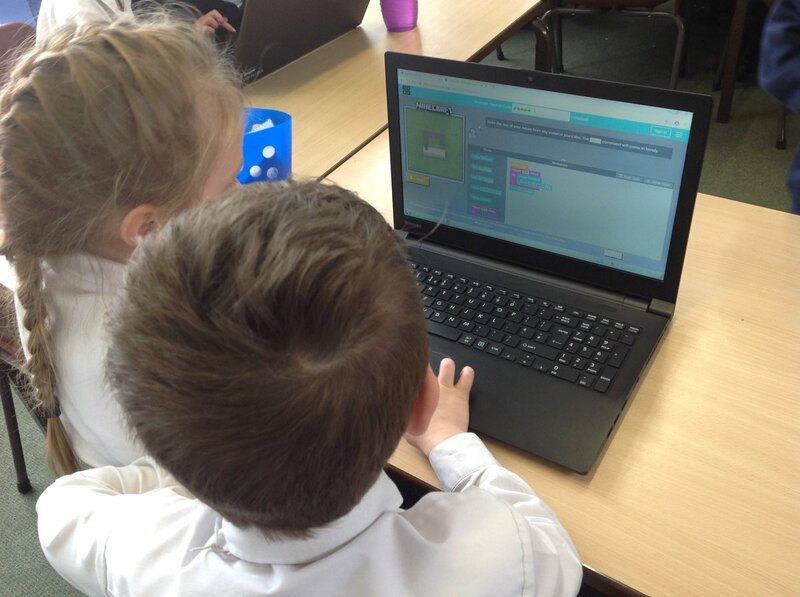 Today the Kingfishers transferred the directional language they have been practising on the playground into a minecraft coding programme online. They had to use the skills they have learnt over the past few weeks focusing on direction, turns and steps to solve the problems. The Kingfishers found it quite a struggle when their coding wasn't accurate and they couldn't solve the problem on the first attempt. 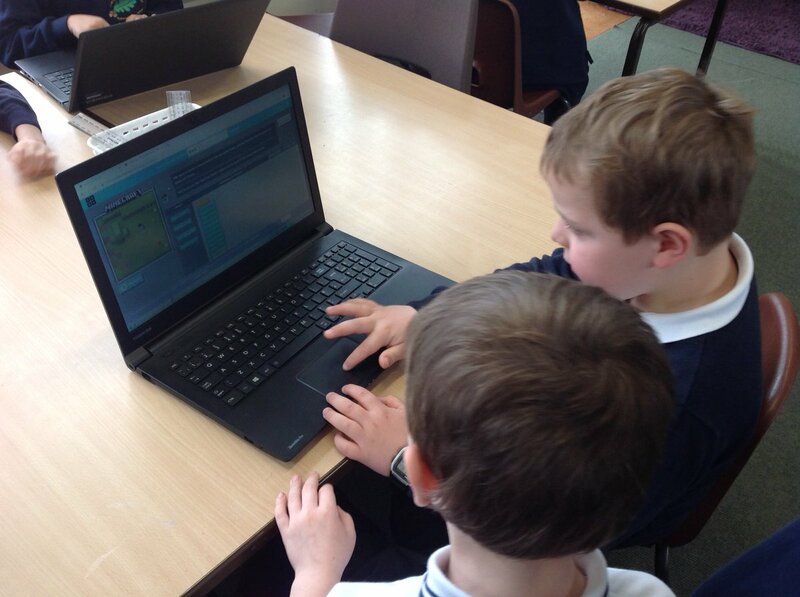 The class worked really hard to de-bug their programming and continue to solve the problems. 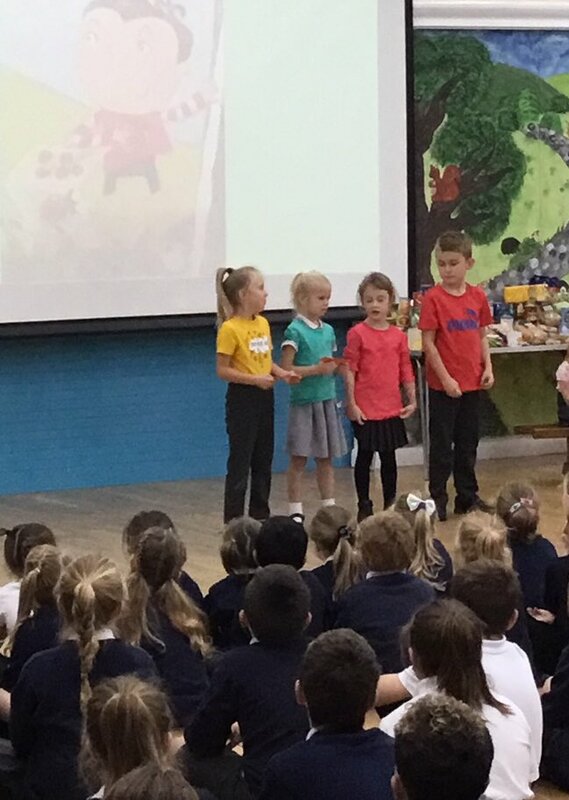 The Kingfishers were over the moon to be awarded the winning class of the sponsored read in celebration assembly today. 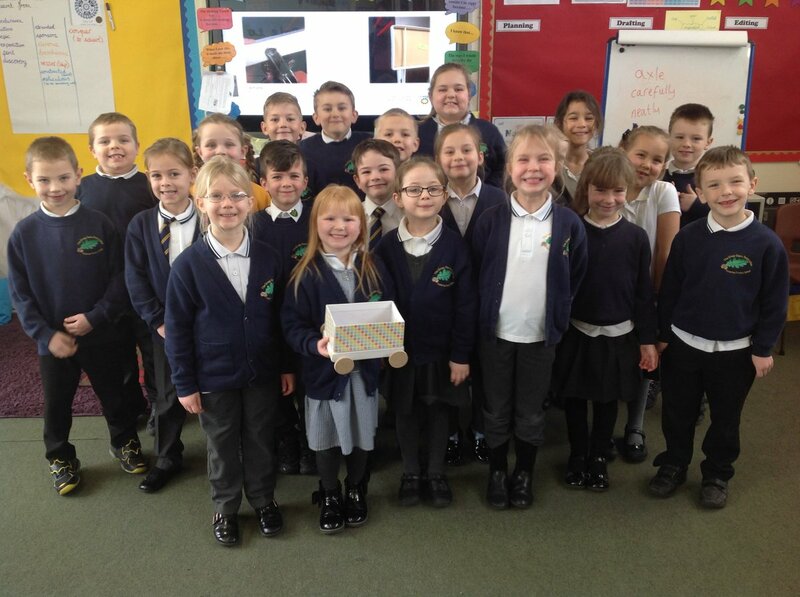 As a school we read 79,652 minutes over the week but the Kingfishers were the top class reading 14,660 minutes. 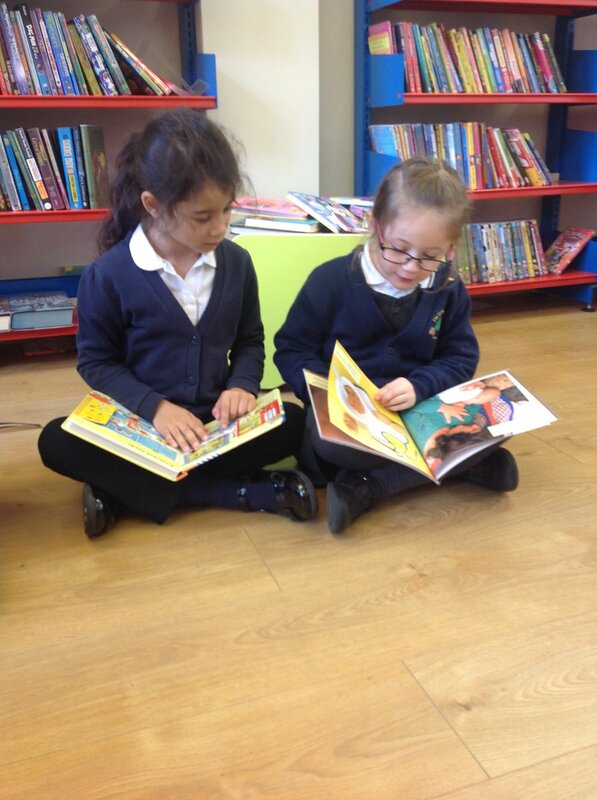 So many special moments were shared this week and it was a pleasure to see children discover new passions for reading after exploring a wide range of different books. there are only children who have not found the right book." How would Wilf survive if the sea unicorn didn't come to his rescue? The children were questioned at the beginning of the week about our story 'The Way Home for Wolf'. I asked them, how would Wilf survive if the sea unicorn didn't come to his rescue? 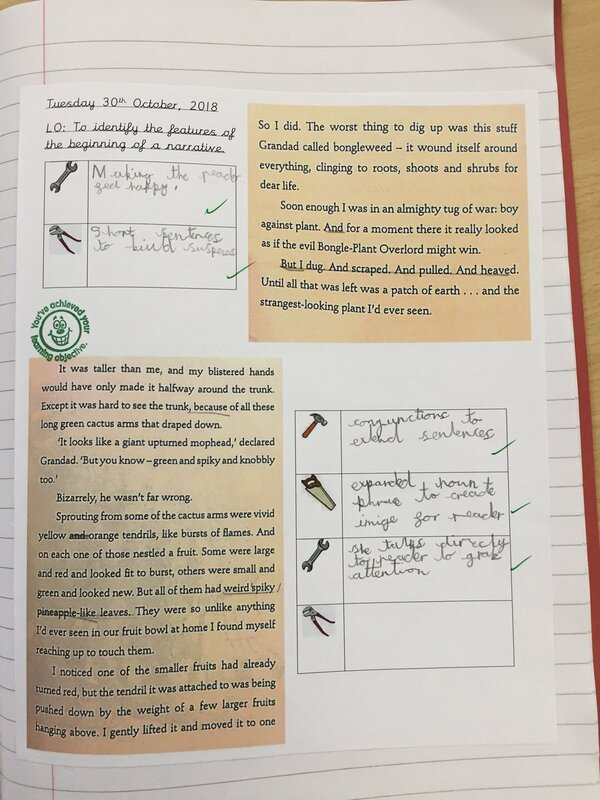 The children used their prior knowledge of Shackleton's journey on the Endurance and thought about what resources they would have available to them. They decided a raft would be possible to build within the situation and with the equipment they would have. 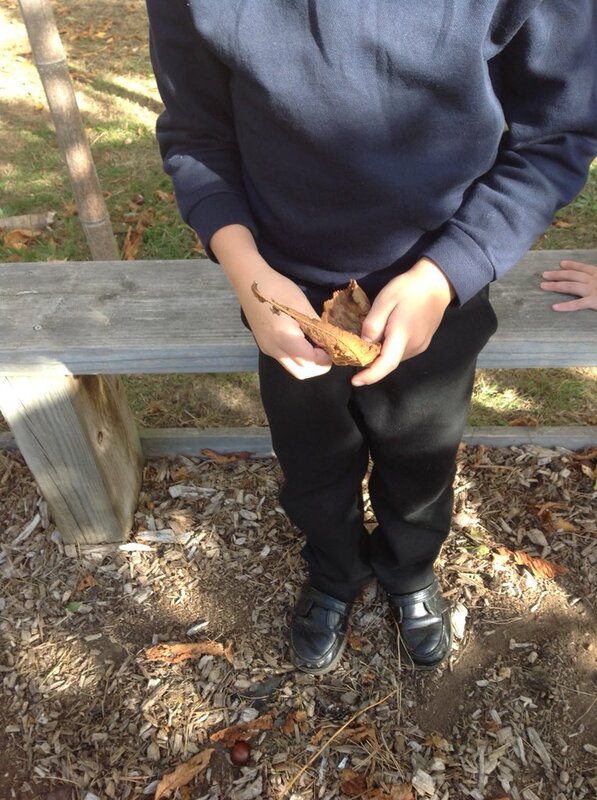 We explored our outdoor environment and gathered all the natural things we needed. 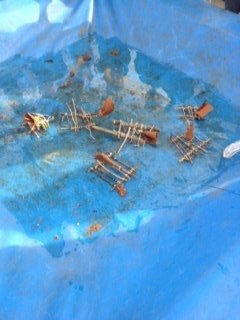 We then worked in groups to build and secure our rafts. 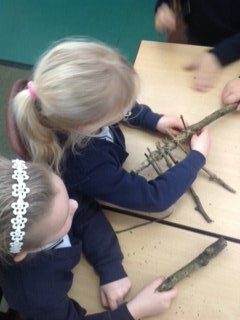 The Kingfishers found this very tricky but with great perseverance, fantastic results were seen. After they were all finished, we tested them out to make sure we would be able to float and survive in the polar regions. They all floated and blew about furiously in the winds. They were great to watch! Over the last couple of weeks, we have been reading 'Way Home for Wolf' and reached an exciting part today about the ice cracking underneath Wilf. 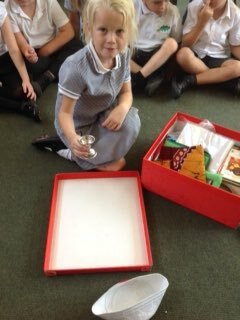 In Science, we experimented with ice to see what would affect it melting and cracking. Majority of the class predicted ice with a thick coat of felt would melt really quickly because it will warm it up. However, tthe discussions I heard were fantastic. They observed the ice and noticed the coat of material was slowing down the melting process as it acted as a barrier from the warm air in the room. Today the Kingfishers had so much fun. 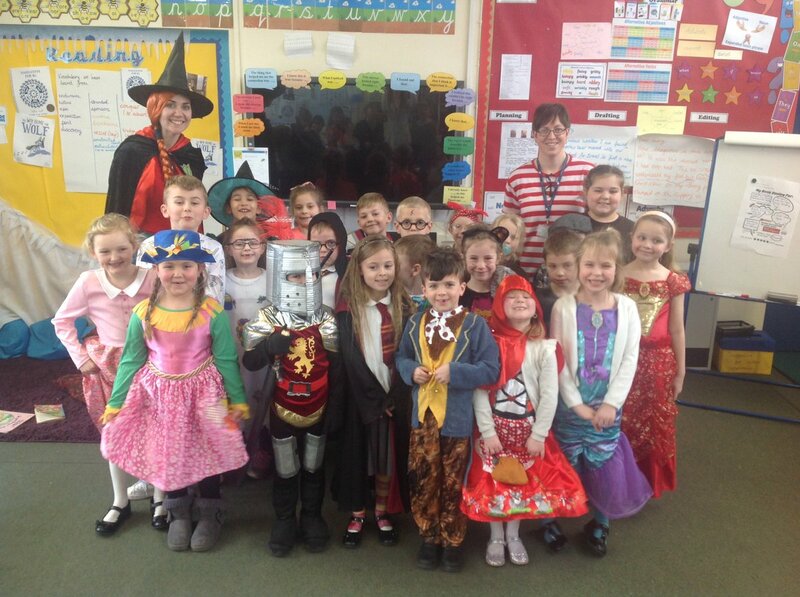 The theme for our World Book Day this year was all about reading for pleasure and we certainly did that. The children chose their favourite character to dress up as and it was lovely to hear their reasoning about why those characters were so important to them. 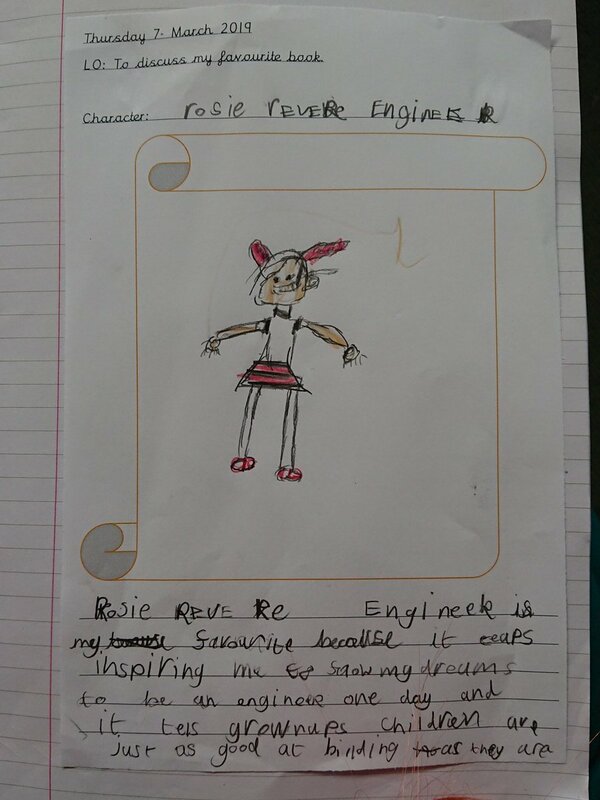 The children are clearly inspired by the adventures they go on when they read. We also spent a lot of time reading for pleasure throughout the day. That included reading from a selection of books including our banded books, library bus books, books from our class reading corner and specific books that link to our theme. 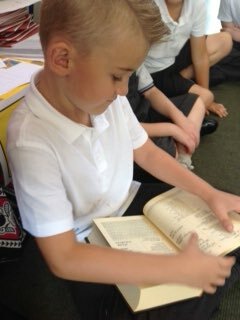 Children enjoyed reading passages from their favourite books aloud to the class and they created fantastic book reviews as well. The Kingfishers had to work very hard today as they developed their hockey skills. They have been practising their grip on the hockey sticks over the last few weeks. Today they began travelling with the ball. Quickly, they realised they needed to focus to keep the ball travelling in the right direction and make lots of small pushes. Well done Kingfishers! Today the Kingfishers really enjoyed their computing lesson outside on the playground. They were learning about programming and in pairs the children were giving each other directions to follow. They worked really hard to include mathematical vocabulary of quarter turn and half turn as they reated shapes on the playground. 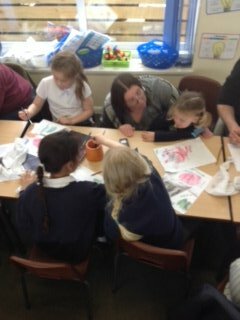 We thoroughly enjoyed the Kingfisher Parent Engagement Afternoon! The scavenger hunt was a great success. 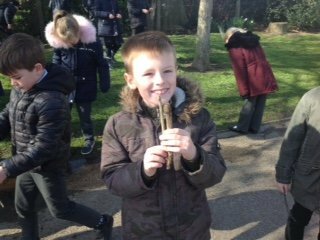 The children used the historical knowledge of Ernest Shackleton they have learnt over the term to answer all the questions on the hunt. 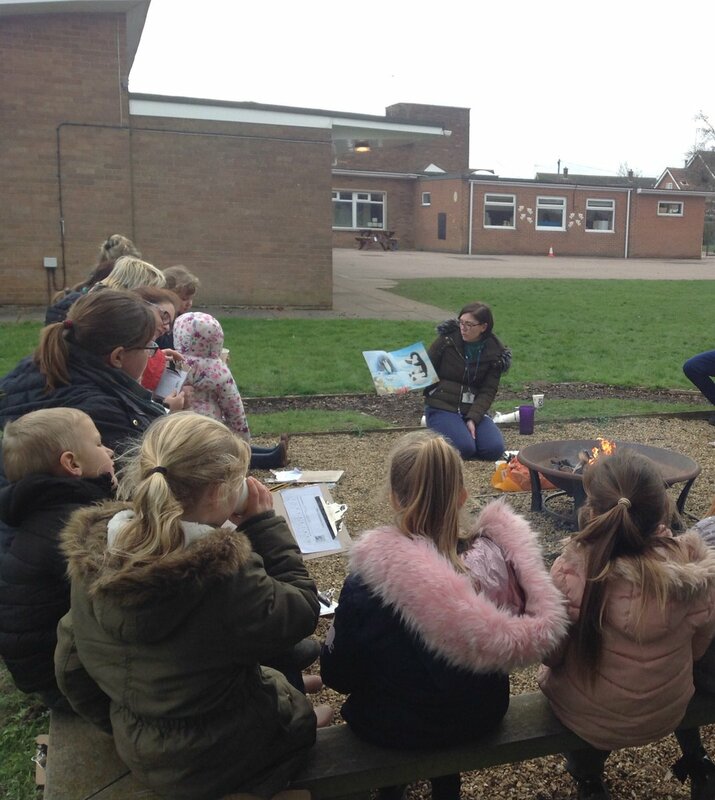 What a better way to end it, then with a hot choc and a story around the campfire! Yesterday and today the Kingfishers visited Planet Ice at Peterborough. As we have been learning all about Shackleton and his expedition to the South Pole, it was great to exerience the low temperatures and travelling over the ice just like he would have done. For most of the Kingfishers, skating was a brand new experience. No matter how many falls we had, they were straight back up on their feet, trying again. 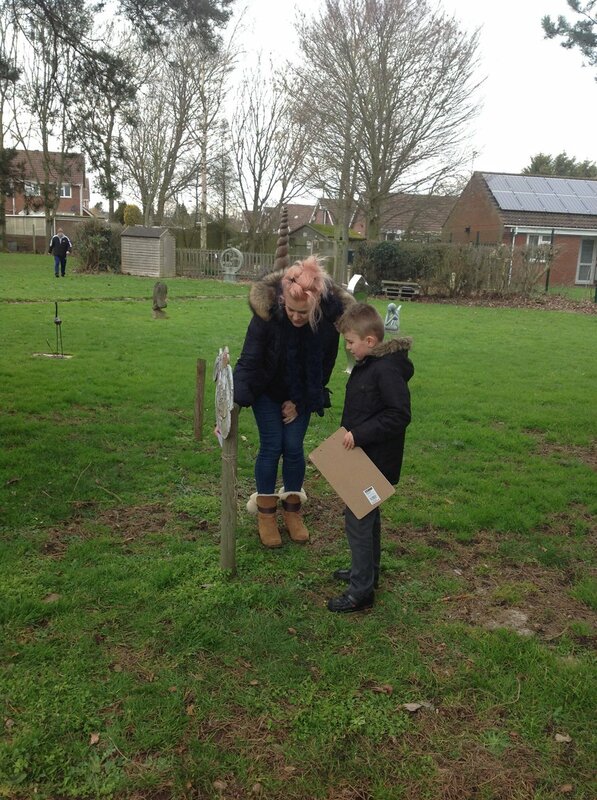 I was very proud of the resilience the children had shown. What a thought provoking week! This week the Kingfishers have been involved in a very practical and experimental STEM week. 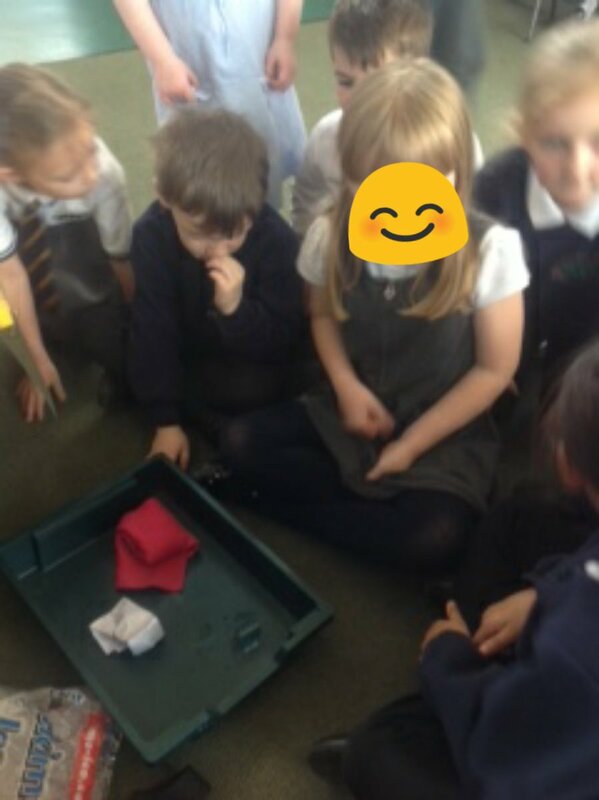 The children have investigated several scientific questions, explored many theories and have started the design and manufactoring process of their cars for our upcoming STEM challenge in the summer. We thoroughly enjoyed ending the week exploring balloons as a pushing force in cars with our parents. Our new theme is well under way and our class display is looking fantastic with the additions of the Kingfishers art work. They have used pastels to create Antarctic landscapes focusing on the variety of different tones of the same colour that are found there. 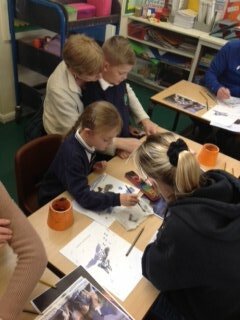 They have also been practising their sketching skills as they drew portraits of Ernest Shackleton. What a great first week back! 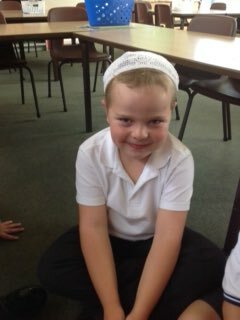 The Kingfishers have loved beginning to explore who Ernest Shackleton was through a range of different lessons especially Dance and Music. The children used Vivaldi's Stormy Sea piece of music as a stimulus for their dances. They used a range of movements to represent the changing weather from a gentle sea to the crashing waves and thunder. Later in Music, the Kingfishers used xylophones to replicate the repetitive changing notes. 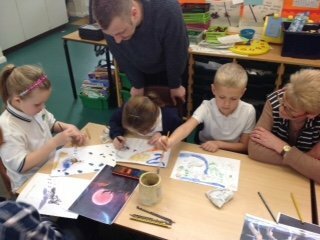 Today was an amazing time in the Kingfisher class as we showed off our cutting skills to our parents. We have practised throughout the term on vegetables for soup and salad but today we used delicious fruits to make a fruit salad. The sweet smell filled our classroom as the parents were in awe of our skills and then we had the fantastic job of trying all the new flavours. The Kingfisher had a fantastic visit to our classroom today from Willoughby Foods' farmer. He explained all the different ingredients that goes into a cheeseburger and where they are farmed from. 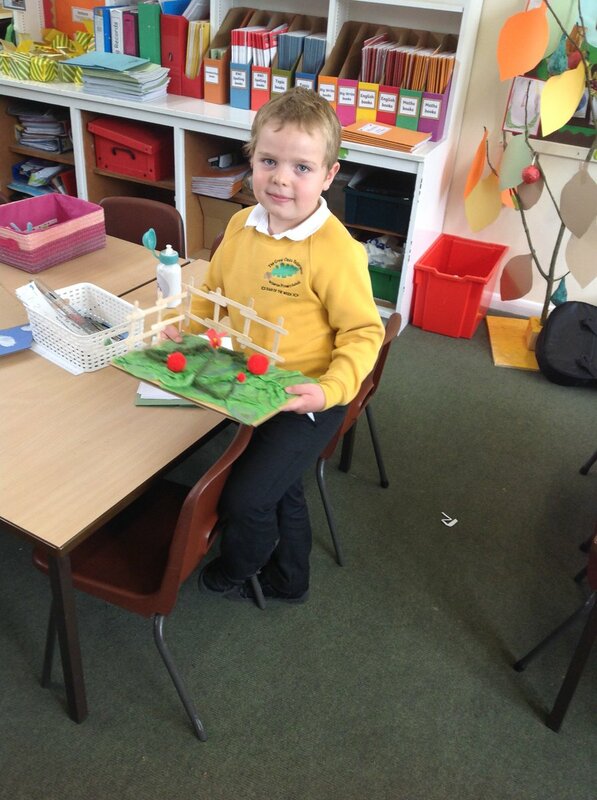 The children also explored how wheat in fields is harvested and the process it goes on in order to become bread. During Road Safety day, the Kingfishers learnt about the importance of helmets when riding bikes and scooters. They explored this further by using a range of materials to create their own helmets to protect our 'heads', which was represented by an egg. Some survived the fall, others didn't. The Kingfishers had a fantastic day learning about the importance of Children in Need as we raised money for the charity. They especially loved meeting Pudsey as he visited our class. The Kingfishers showed Pudsey how much fun we have playing outside. 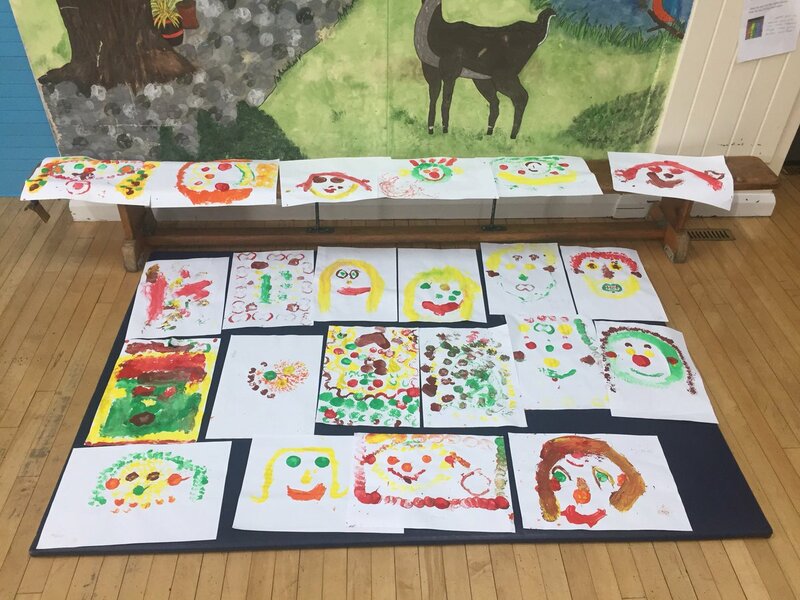 The class also looked brilliant dressed up in their spotty clothes and crazy hair. The Kingfishers had an incredible time visting the Boston Library. 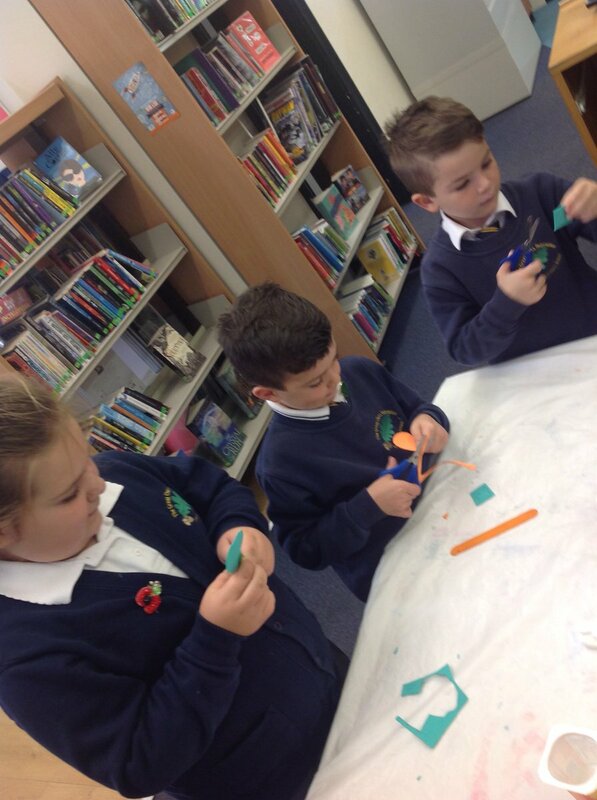 They thoroughly enjoyed exploring all the books based on our theme 'Ready, Steady, Grow' and making our vegetable inspired book marks. The Kingfishers have loved getting stuck into their new class novel by Andy Shepard. They loved enquiring about the fruit that appeared in our reading corner and creating questions. Using the author tool kit, they explored the features that made the beginning so great before writing their own. 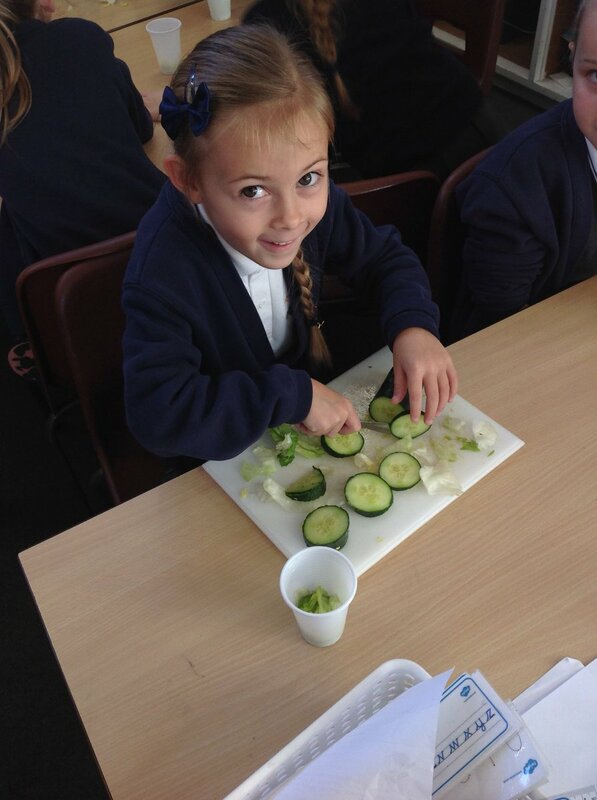 Continuing the Ready, Steady, Grow theme as the Kingfishers created their own healthy salads this morning! It’s great to see them learning independence as they prepare their own food. 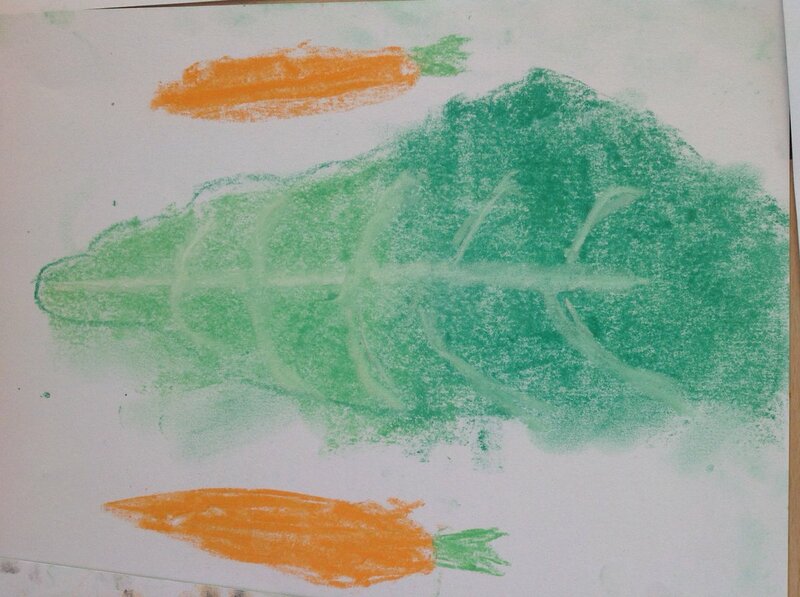 The Kingfishers have had a fantastic afternoon vegetable printing portraits with their families! The smiles on the children’s faces were great to see. However, by the mess the parents made, I think they had just as much fun too! What can your plant grow? Wow! 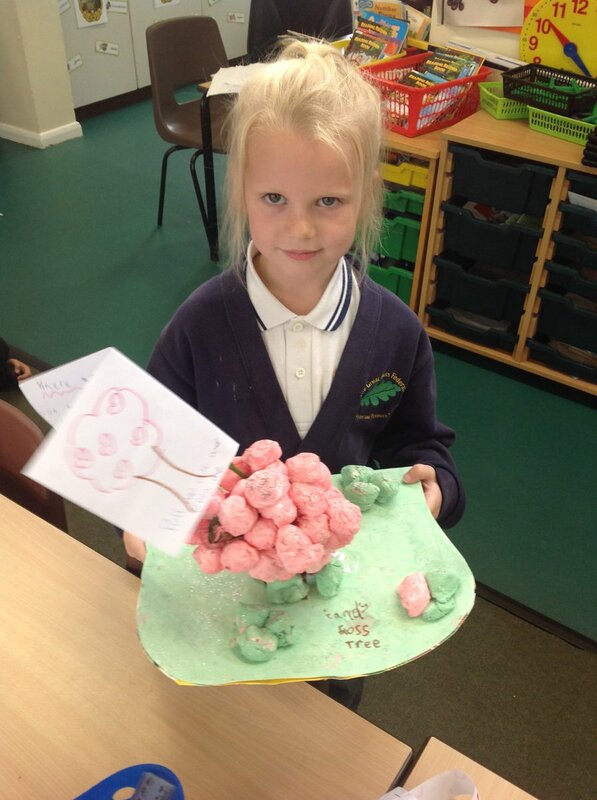 The creativity the Kingfishers have shown on their homework projects has been mind blowing! 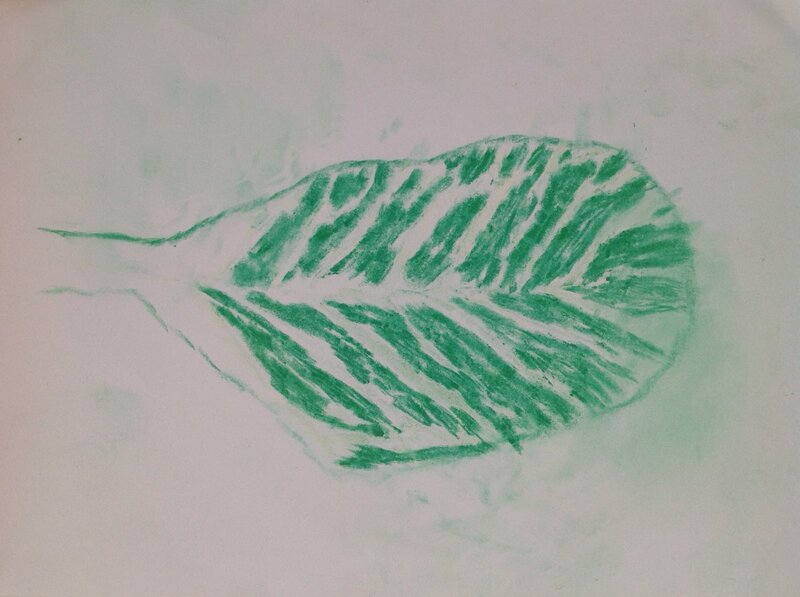 They were asked to design their own plant. Our classroom is now full of plants that grow fairies, cheese, camper vans, chocolate and so many more! So proud of them all! Amazingly proud of my Kingfishers yesterday! Their performances were great and their singing was beautiful! 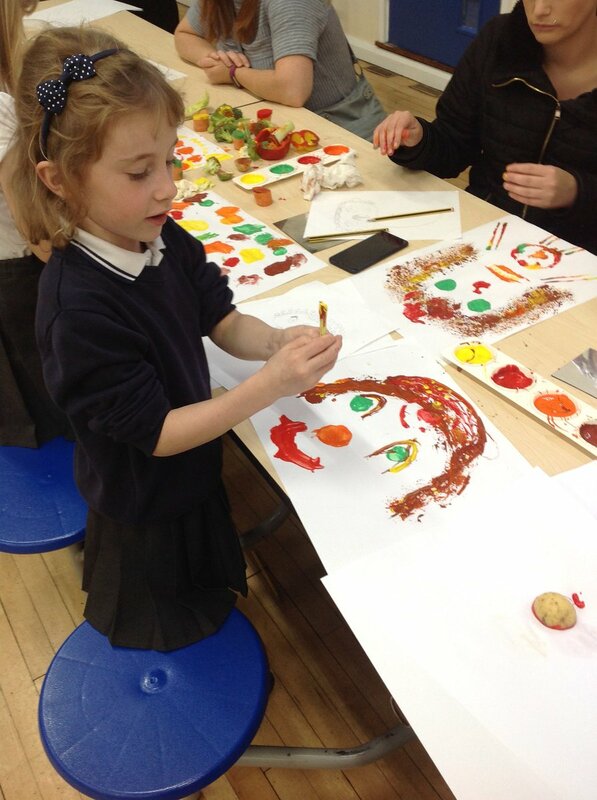 The parents were very impressed too! 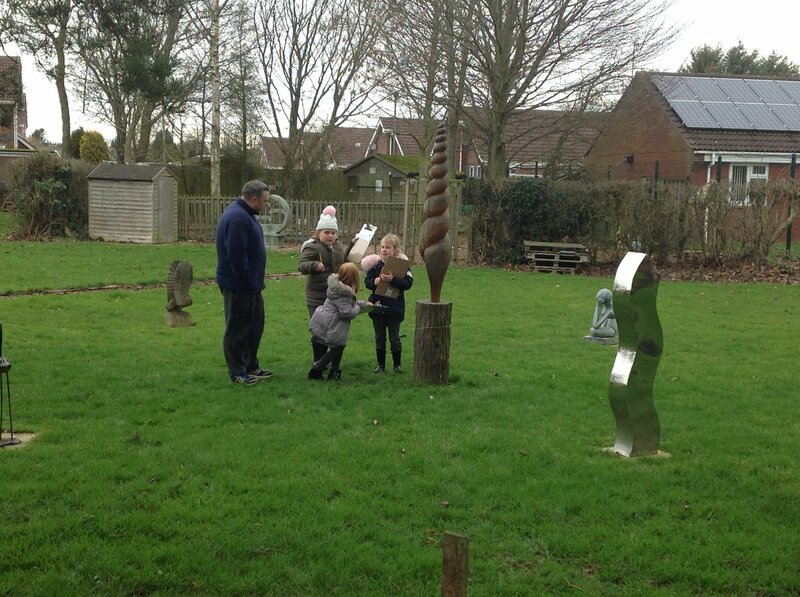 The Kingfishers were very lucky to have a special visit today! 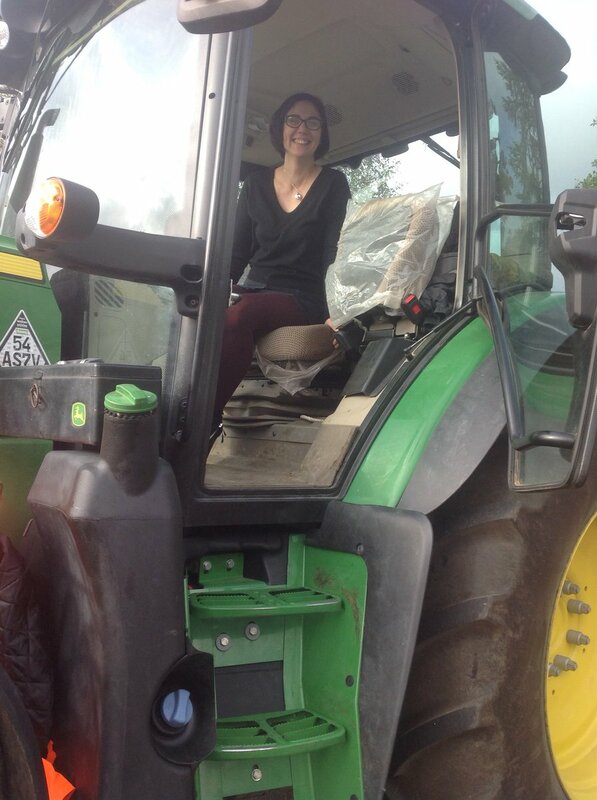 After learning all about Harvest, it was great to a real life tractor. 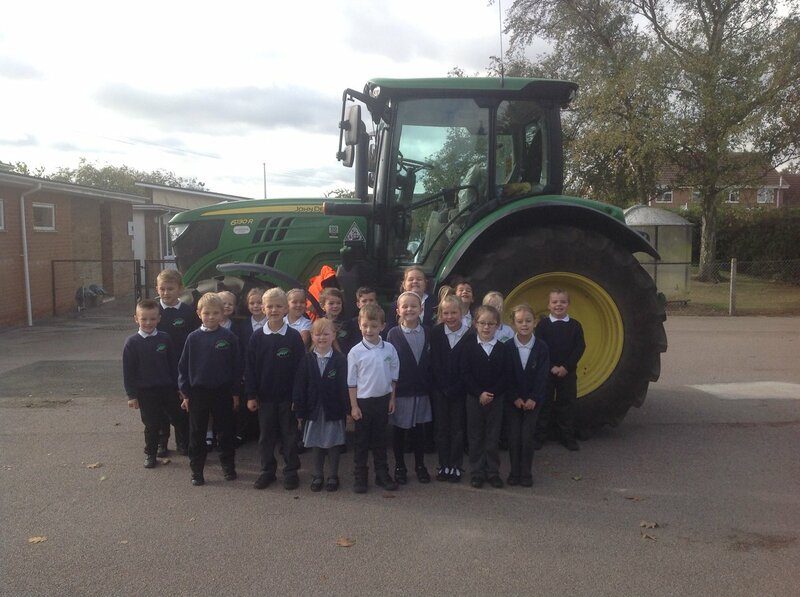 The children were amazed at how big the tyres were and loved asking Farmer Miller questions about how it works. Even Miss Anstey wanted to join in the fun! Talk for writing in Big Write today was very exciting. 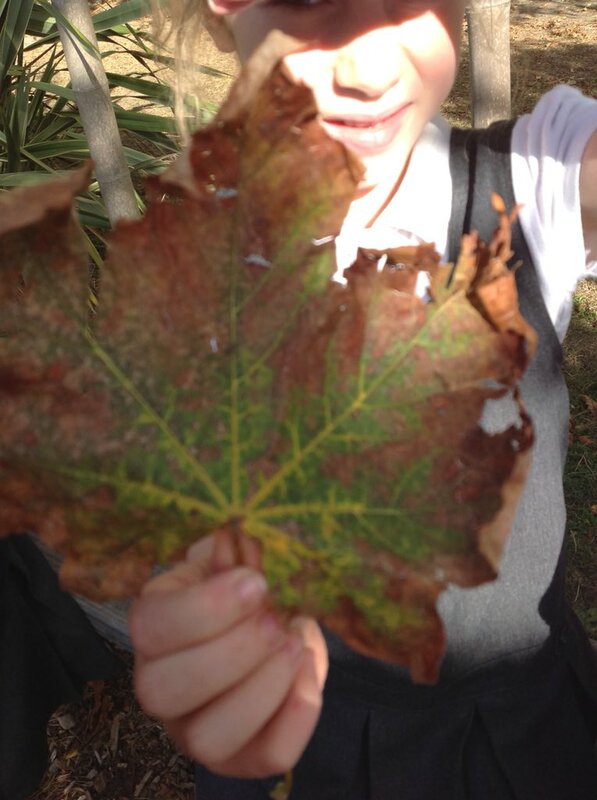 Before the Kingfishers wrote their setting descriptions, we explored the autumn sights, sounds and textures. The children got very excited when the gardener started to use his leaf blower and they could watch the colourful leaves swirl around. 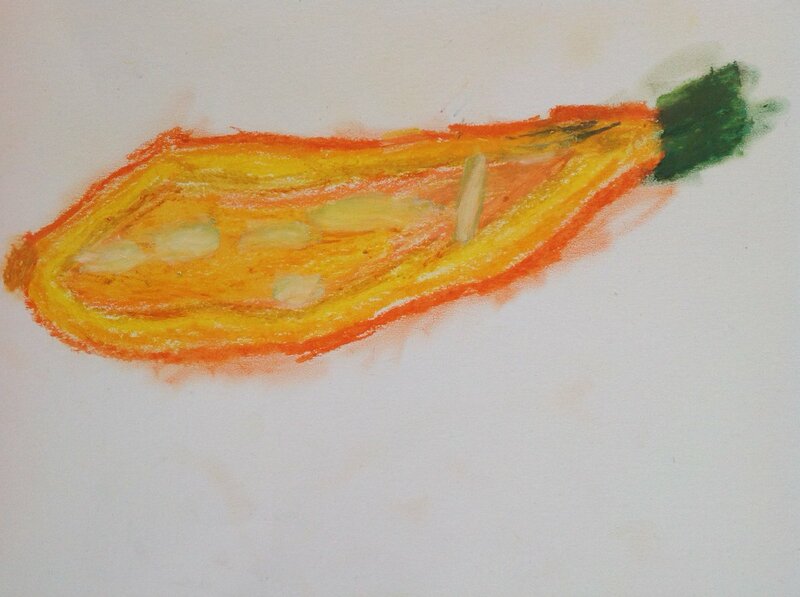 Just a selection of the inspired Kingfisher’s pastel art work from this afternoon! 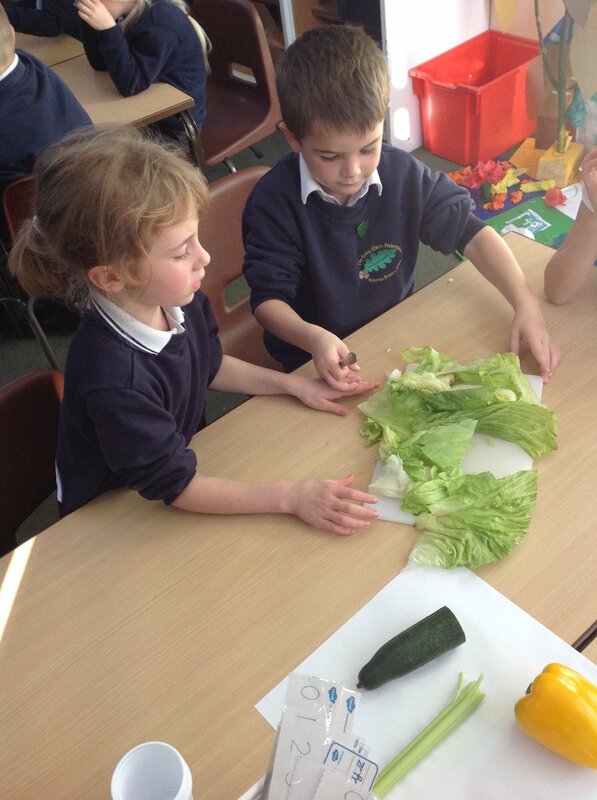 Their attention to detail was great after they had investigated the vegetables from the local community. 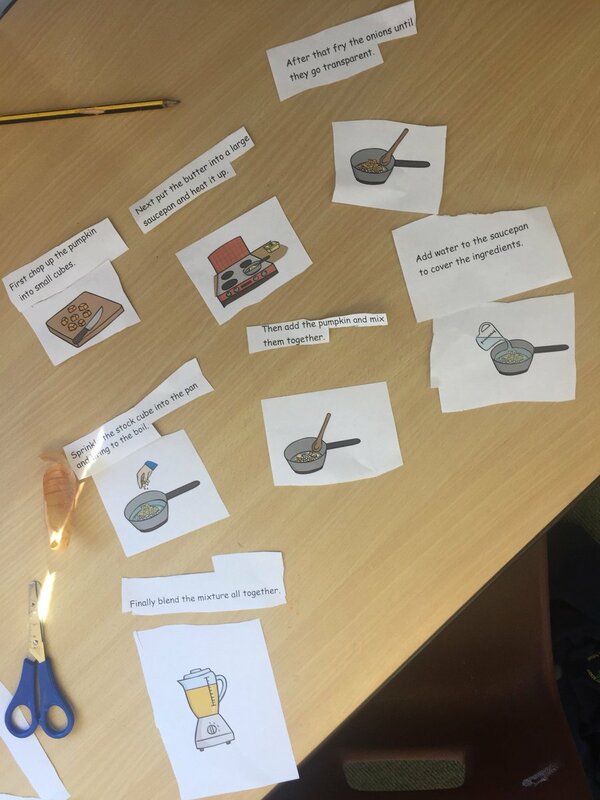 With our fantastic, delicious creation fresh in our minds, the children ordered the pictures and instructions based on how they made their soup. The best you've ever tasted! 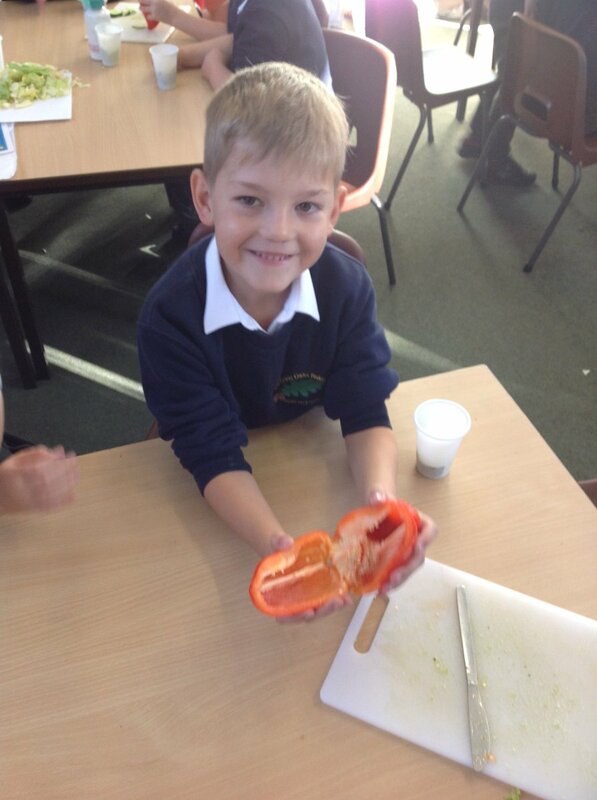 After reading 'The Pumpkin Soup' in class, we were inspired to create our own healthy soup. 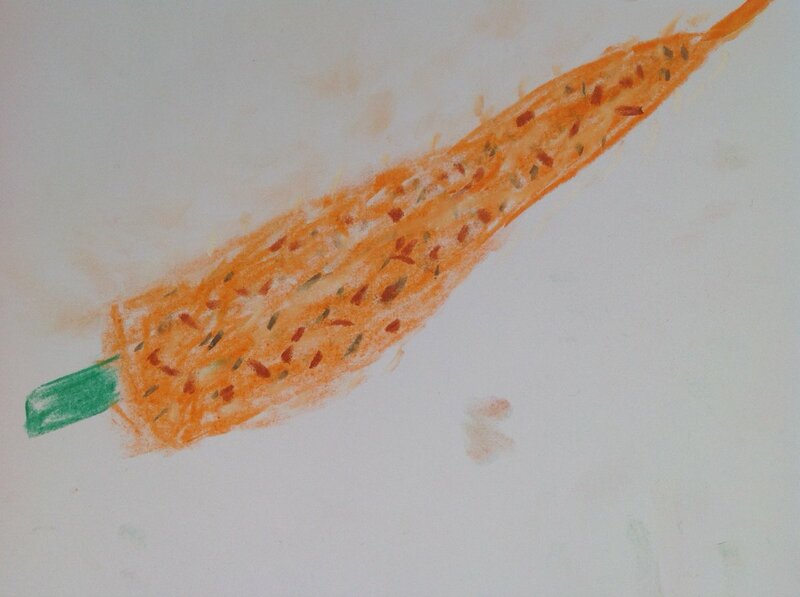 The children practised their knife cutting skills as they prepared the onion and butternut squash and they were able to describe the different textures as the vegetable textures changed as we cooked. It was great to see their reactions as they smelt the finished soup. Hands on, exploration is the best way to get children engaged and developing their vocabulary! 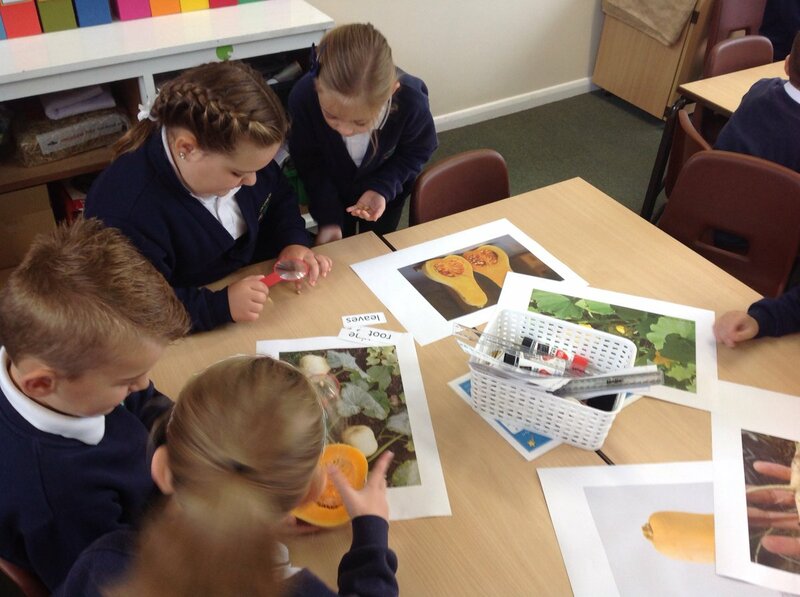 The children were carefully observing the fruit and they were having fantastic discussions about what they were finding. 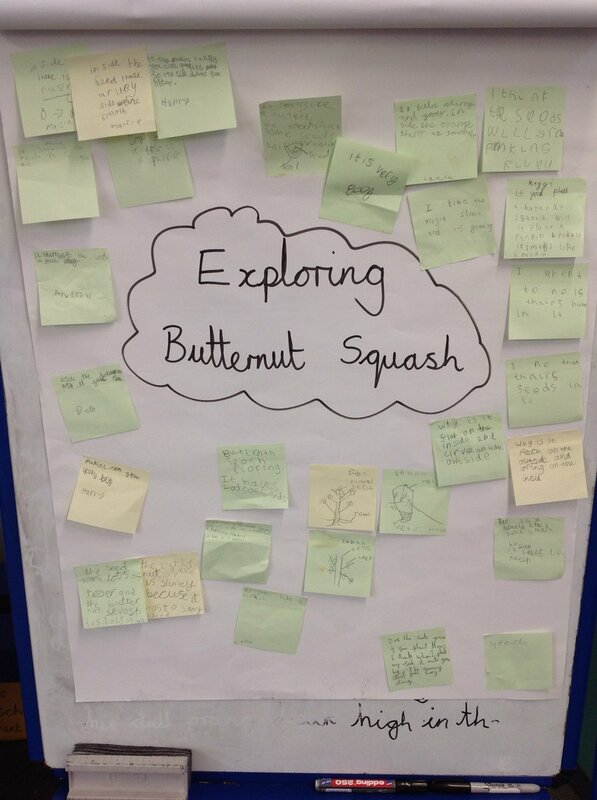 It was lovely to read all the Kingfishers observations about the butternut squash and the thought provoking questions they were generating as they explored. 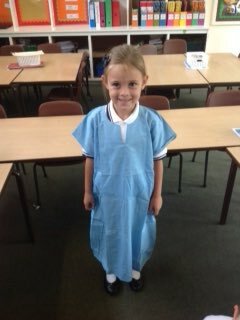 It was lovely to see the children's reactions as they came into class today. The Kingfishers have been carefully observing their cress heads and are enjoying to see the difference each day. They are spreading their enthusiasm with anyone that visits our classroom and it is lovely to see them talk so in depth about their learning. 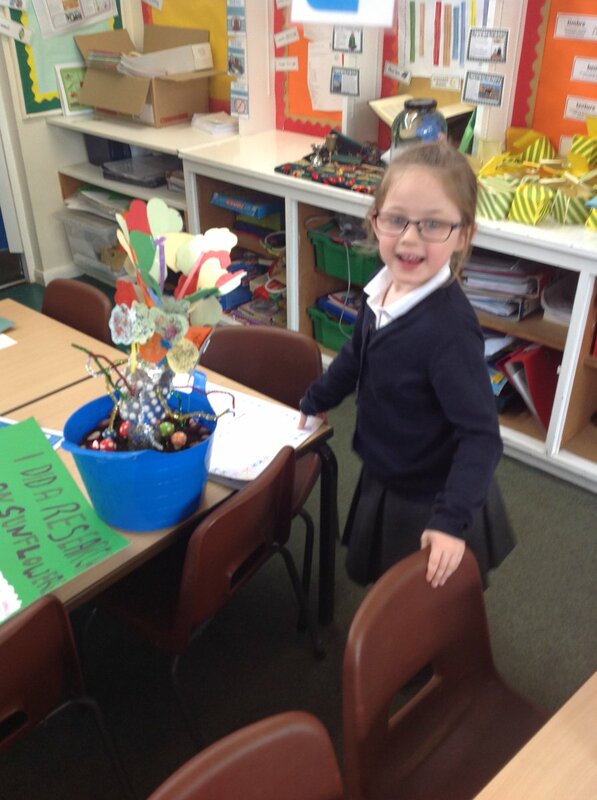 Magical moments in the Kingfisher class today! 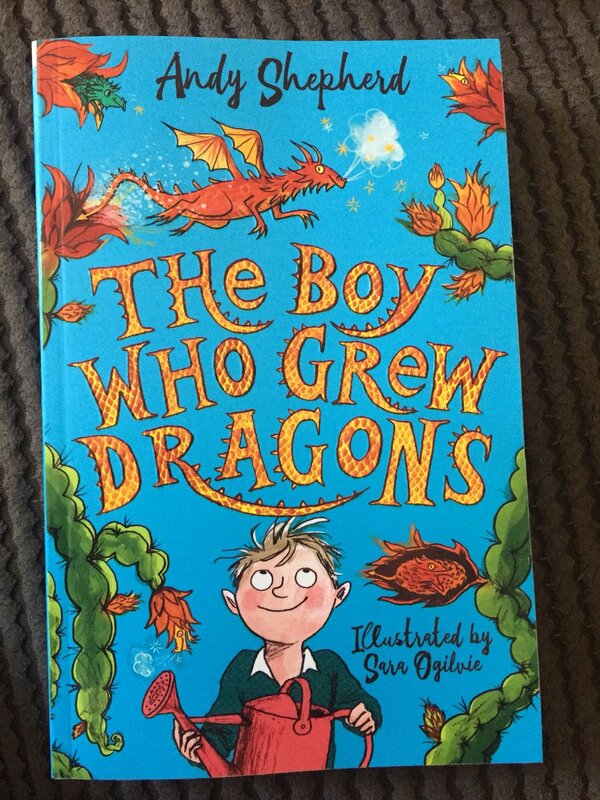 Big Write can be very daunting for some children as there is so much to think about- What do I need to write about? What punctuation do I need to include? Have I used the best vocabulary? 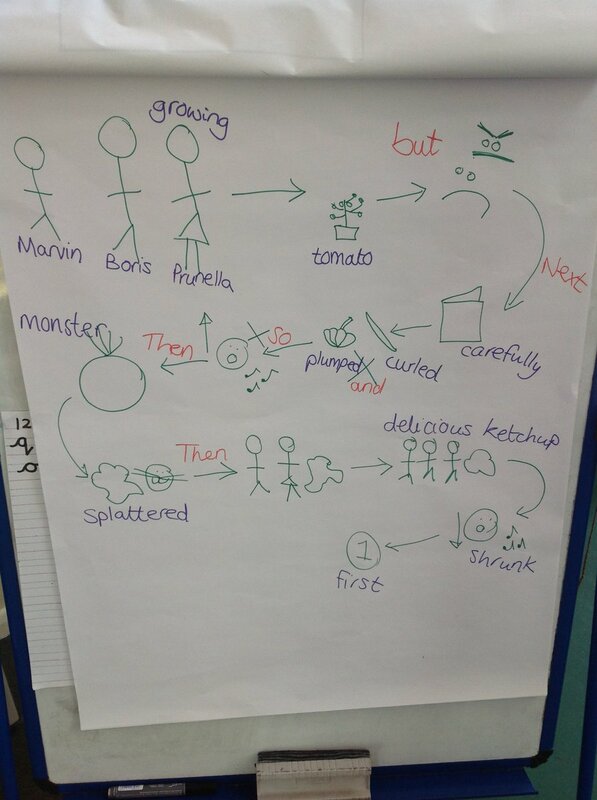 But after a very successful 'Talk for Writing' using our class story map, the children were able to retell one of their favourite books, 'Oh No, Monster Tomato'. 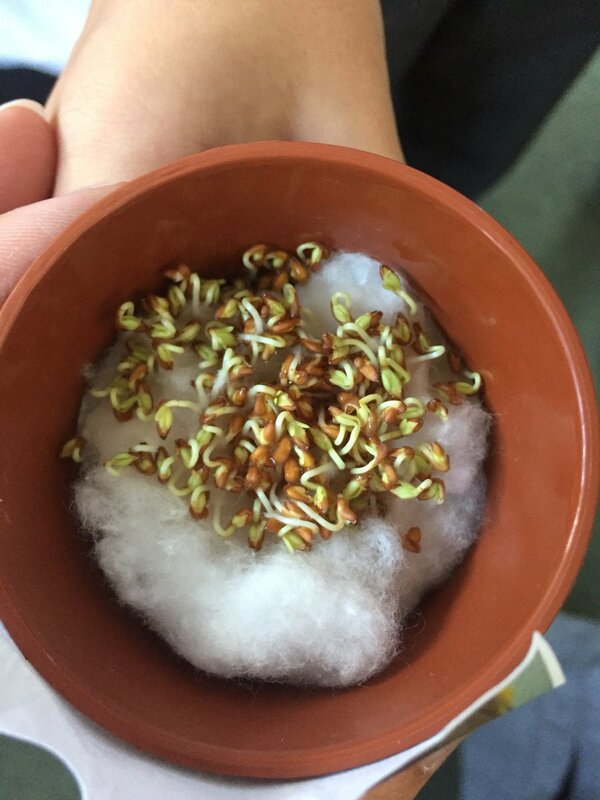 This morning our class was full of very excited children as they spotted a tiny, little something growing at the back of the classroom. 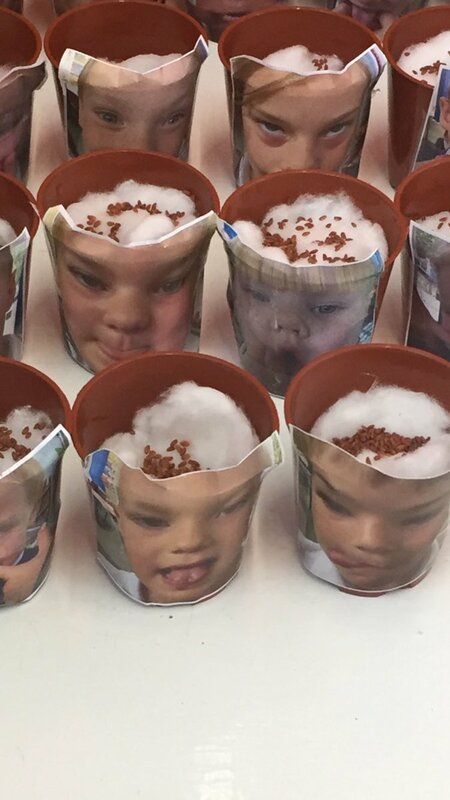 Only 48 hours after creating our cress heads, the children loved to observe the changes. They used these as their stimulus for their observational drawings in Science. 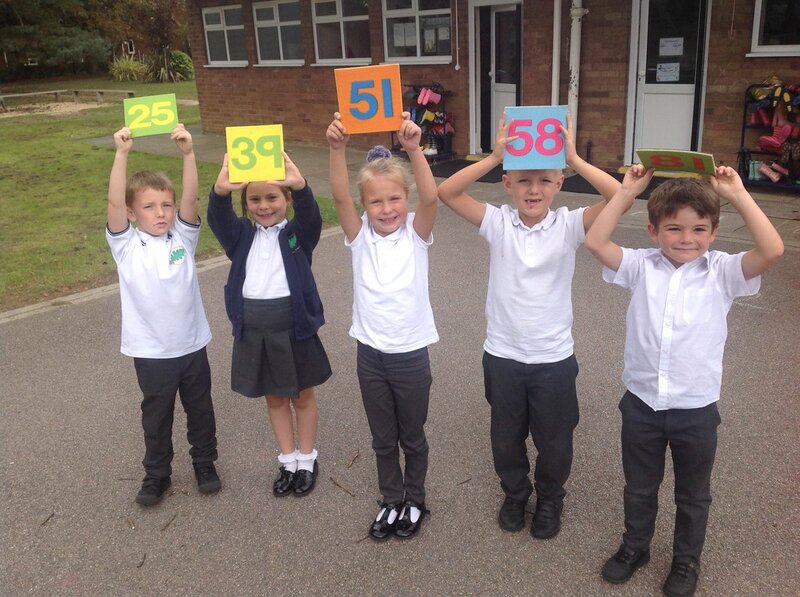 The Kingfishers loved their Maths challenges outside this afternoon as they embedded their place value knowledge. Using number tiles they had been given, the children had to discuss with each other the value of the numbers and to order themselves within their groups. They also had to create the greater than and less than signs on the playground to complete comparisons between numbers. What is inside the mystery box? What religion do you think we are studying? 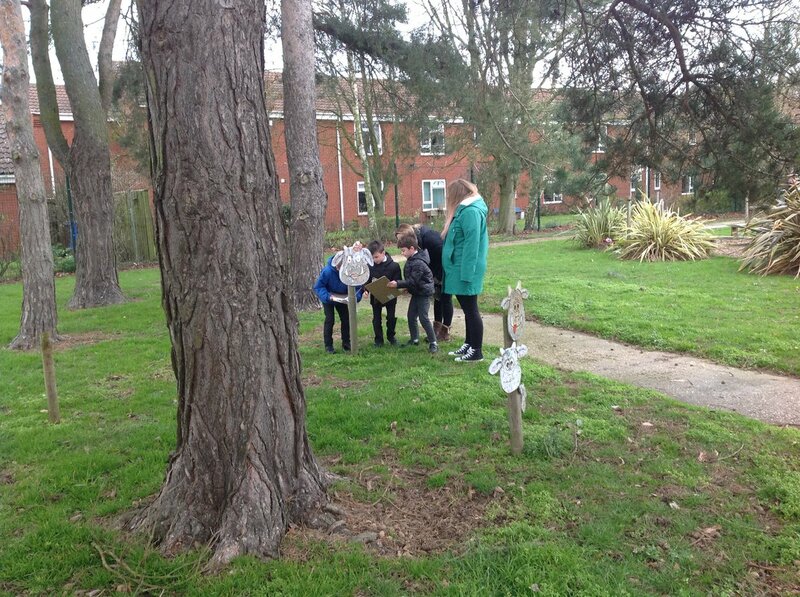 The children were given a box of artefacts to explore, without prompts or being given any information. 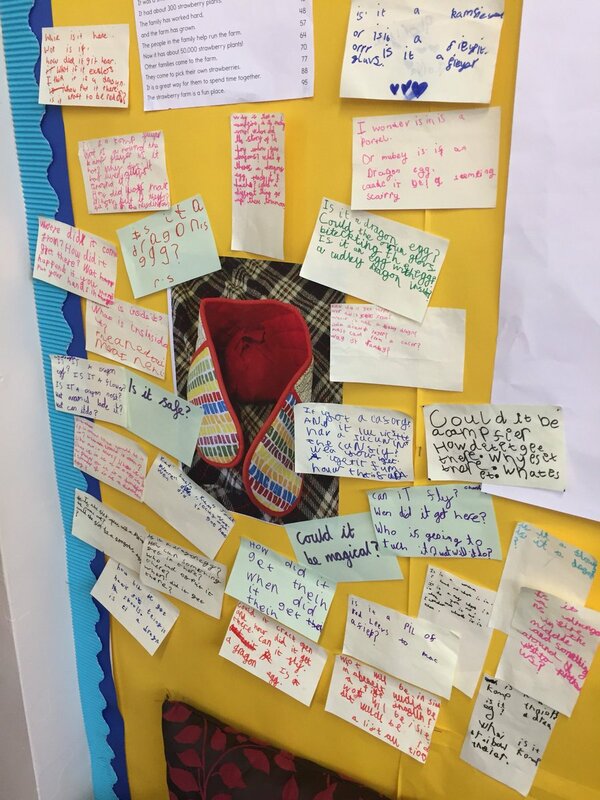 They had the opportunity to discover, discuss and to make their own suggestions about what everything was and what it could be used for. I was so proud of their thoughtful and well reasoned suggestions and now the children are very excited to learn even more about Islam. 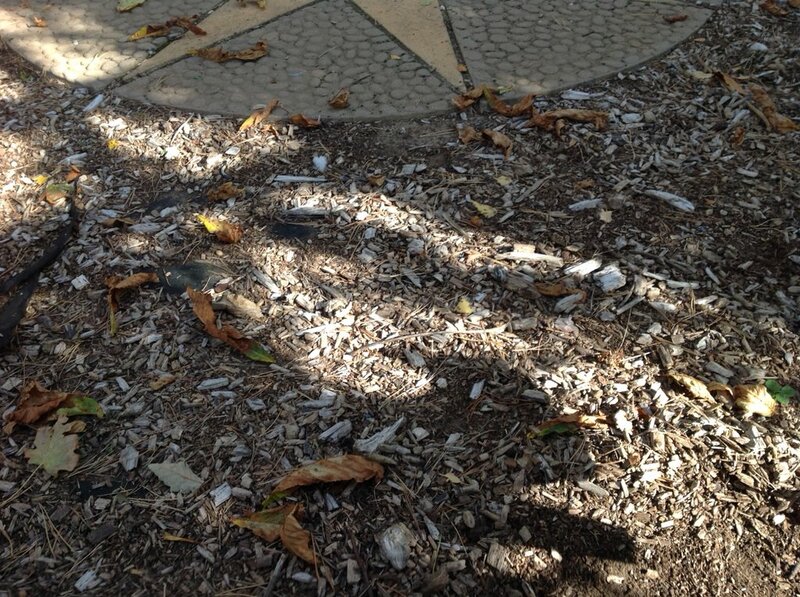 What will happen to our seeds? 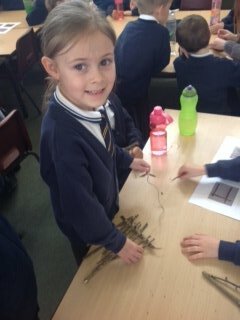 The Kingfishers have been exploring seeds and they are beginning to look at what happens to a seed as it matures into a plant. 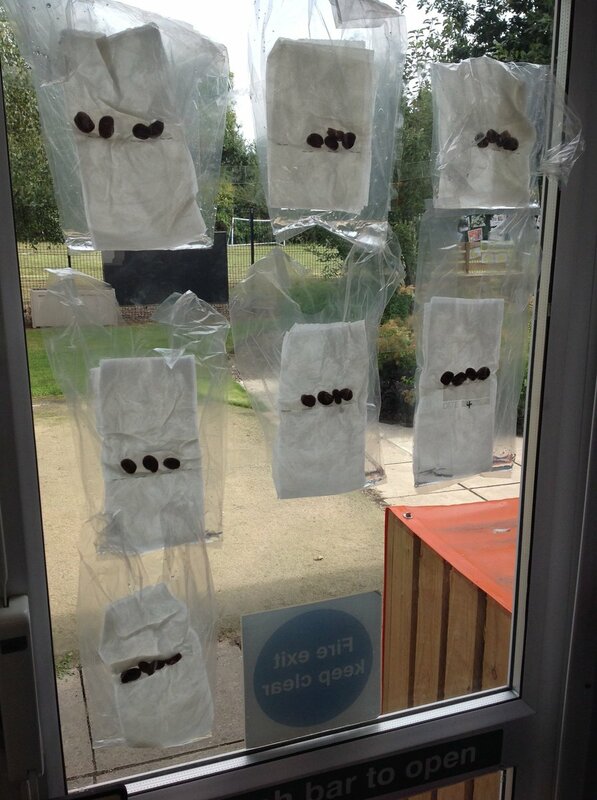 Ensuring they have the opportunity to observe these changes, the children have created cress heads and set up broad bean hydroponics on our window. We are extremely excited to watch them closely. Who will grow the longest cress hair? 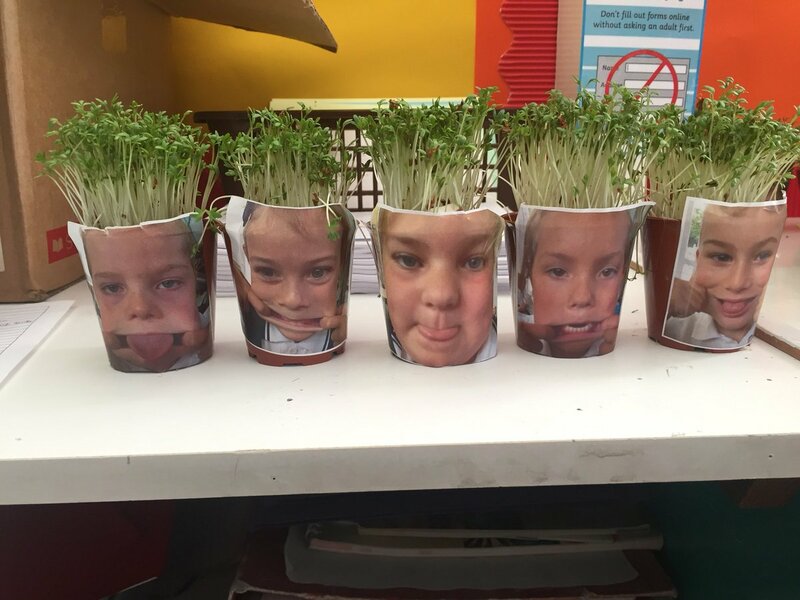 How will the cress taste in our salads we will create in DT? Our growing themed reading corner has definitely got the children excited about exploring books. It has been amazing to see the children eager to pull up a cushion, grab a book and share their favourites with their class mates. Here is the amazing Kingfisher display created by the children during transition week. This was their opportunity to show our new identity as a class and I was in awe of their enthusiasm. 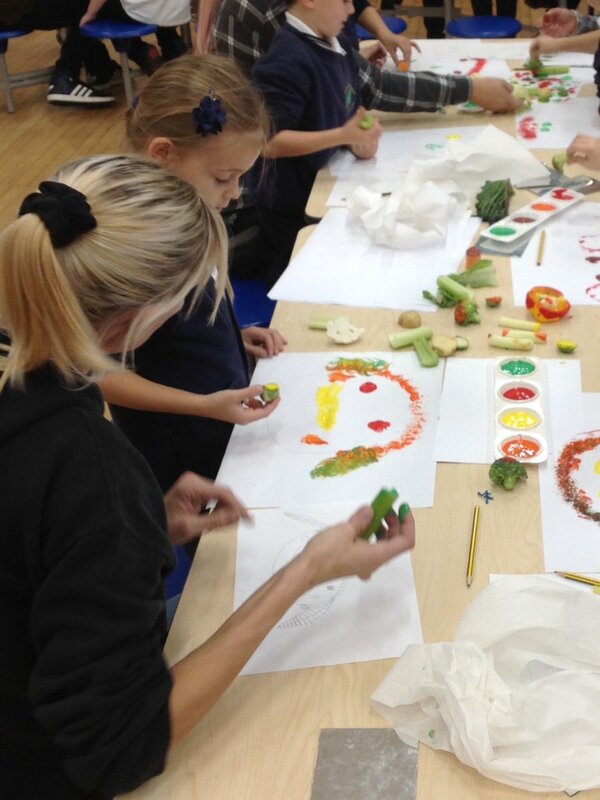 They excelled in their art lessons using a variety of skills including sketching, painting and collaging. They also showed such a positive attitude as they set their aims for the upcoming year.